People I’ve spoken to recently, quite high up in tourism and travel businesses, have been a bit dismissive of SEO. They’ve heard on the grapevine that SEO is dead. But this couldn’t be further from the truth. Search Engine Optimisation is very much alive and absolutely essential for tourism companies to get found online by potential guests and customers. The trouble is that SEO has gained a very bad reputation for spammy, pushy, underhand tactics employed by some practitioners. Inevitably there are some in this industry who have been burnt and suffered a loss of search rankings as a result. But professional and legitimate SEO can gain secure top spots in Google and a huge stream of web traffic for hotels, resorts and other tourism companies without fear of penalty. These discussions reminded me of a blog post I originally wrote for another website, following the launch of Google’s Disavow Tool last year. This was Google’s attempt at offering an olive branch to those who had done bad SEO to come clean and ‘disavow’ the bad links which are hurting their rankings. What I wrote then, still rings true. Despite Google’s crack down, bad SEO may be dead but quality SEO is still alive and producing excellent return on investment. SEO is dead… It’s a claim that’s been brandished around the internet for some months now as Google releases update after update to crack down on the less ethical efforts of some SEO practitioners. Panda, Penguin and other animal themed updates have wreaked havoc on ‘traditional’ SEO. Now Google has introduced a new tool – the Disavow Links Tool – which some commentators are hailing as the final nail in the coffin for an industry which has relied too heavily on spammy links for its search engine prominence. What’s certainly true is that the glory days of quick wins and big SEO successes are over. It’s no longer acceptable to throw a handful or hundreds of links from dubious sources, such as paid links and low quality blog networks, in an attempt to get a website to stick at the top of the search engine results pages. And websites which previously employed this tactic have been significantly slammed by Google’s anti-spam algorithm changes. But now Google has extended an olive branch and has provided a way for website owners who have unwittingly (or even purposefully) accumulated these dodgy links to remove them using the Disavow Links Tool available in Google’s Webmaster Tools. Think of this as a ‘links amnesty’. Google is aware that nefarious SEO practices have occurred and gives people the opportunity to disavow these links to help clean up their act. But most website owners needn’t panic. Only those that have received notification in their Webmaster Tools about “unnatural links” pointing to their site need to worry. If you have received this message it’s time to roll up the sleeves and get to work requesting the removal of these dodgy links wherever they have scattered on the web. If this proves impossible for the sites you can’t access then Google invites you to own up to these dodgy links in its disavow tool. It goes without saying that if you don’t have your site verified in Webmaster Tools, it’s best to jump right in and find out if your site has been affected. 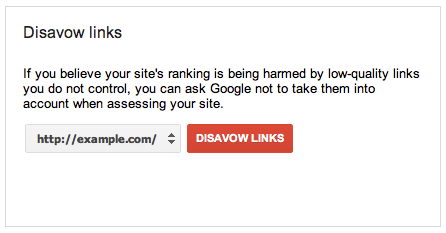 Whether or not the disavow tool will enable websites to clean up their image remains to be seen. Some experts are advocating the abandonment of infected websites. They simply say it is easier and better to start again from scratch. But it’s hard to face this reality if you’ve spent years building up your online brand. Of course, the arrival of this tool does not signify the end of SEO. Instead it is dragging it kicking and screaming into a better, cleaner web where good quality, authoritative content is valued above all else and the old SEO tricks are becoming a relic of the distant past. Business owners and webmasters will still want to work hard to achieve high rankings in the search results and do what they can to stay ahead of their competitors. But they are going to have to work harder at producing good, informative and useful content that is valued in this new era. So SEO lives on, it has just evolved into something healthier and more productive for website owners and people searching for their products and services. Long live SEO… whatever form it takes in the future. Read more about the new SEO tool on the Google Webmaster Blog. Or watch as Google’s Matt Cutts explains this handy SEO cleansing tool. Elliot Walker is the founder and director of Coast 360 Digital Marketing. A former journalist and travel content producer for Virgin Media, Elliot has over 15 years of web marketing experience. He is an SEO specialist with expertise in managing website design and content strategy to maximise search rankings.